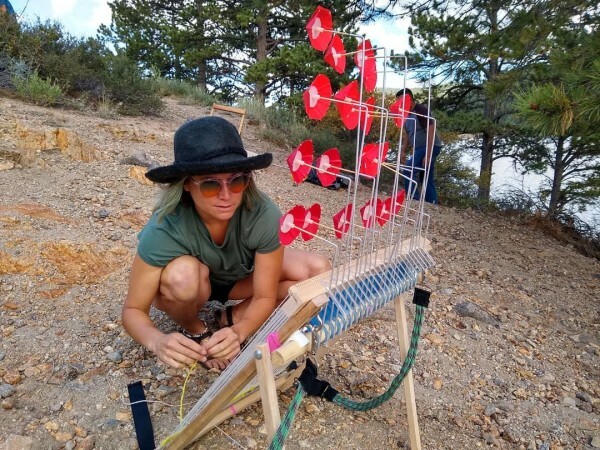 An exploration into new mechanisms for DIY jacquard weaving, as well as an ongoing interest in asking how non-human materials or forces can be engaged as collaborators resulted in the prototype of the wind loom—-a modified tapestry loom that with every 4th warp connected to a sail that moves the warp position in and out. The fabrication of the loom was led by Jen Mah and Rachel Bork, who iterated between several prototypes for laser-cut heddle/hooks that can be attached to the yarn, arms are connected to umbrellas that can move when the wind blows, easily attachable and detachable components to support easy travel, and so on. Nearly everything about this design process has been frustrating, from the difficulty of waiting for windy days to test to the stress and anticipation that such a wind loom produces. As I considered a redesign, I began to think about this experience of frustrating and my almost reflexive response to design it away. It has made me wonder if collaborating with the wind ought to be frustrating and if we just stuck through frustration a bit more, then maybe we wouldn’t have some of the negative effects we see emergent from innovation. Rather than seeing this as a “wind loom” I began to think of it as a kind of tool for becoming frustrated and learning how to deal with that emotion. In consolation, you will learn a great deal about the wind patterns in your local region.